The entrance to one of Brisbane’s popular outer suburbs has been transformed by a public art installation that is a stunning testimony of the contributions made by the local community. 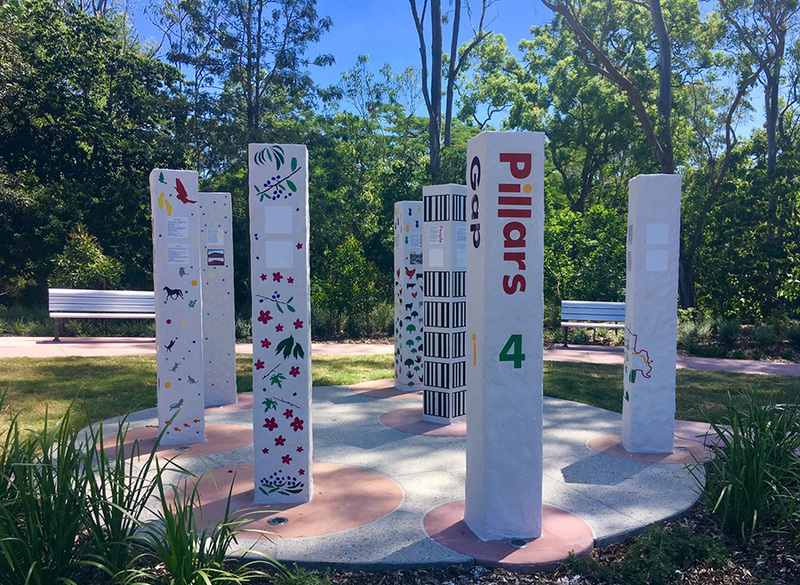 Created by renowned Brisbane artist Catriona Holland, Pillars of the Gap comprises seven pillars depicting different themes, which taken collectively are a unique reflection of the residents of The Gap and the physical environment in which they live. The installation was commissioned by Steven Toomey, Councillor for The Gap Ward, as part of the Walton Bridge Park upgrade. Catriona, who also helps conduct visual arts workshops at the Access Arts Eight Mile Plains studio is no stranger to public installations. You can find more of her artwork at other parks in Brisbane (Oriel Park, Ascot, and the Alfred & Lucina Best Park, The Gap, to name a few), South Bank Parklands, Samford Cemetery and Yeppoon waterfront. You can find Pillars of the Gap at the junction of Waterworks Road and Jevons Street. And don’t just drive by! This installation is best experienced up close.